Nebraska is known for its crop, and for its stature in the agricultural economy. Land of the cornfields and home of the Cornhuskers. Perhaps, then, it comes as no surprise that Nebraska embraces the Farm-to-Fork movement. Loosely understood to be an effort to get locally sourced food into restaurants, cafeterias, and homes through farmer’s markets, the concept was recently lauded by a member of Nebraska’s Congressional Delegation and has been embraced by the Nebraska Tourism Commission for a number of years. Farm-to-Fork: a movement that connects food producers to consumers. Nebraska’s agricultural prowess is well known, and one might assume that its annual bountiful harvest would be easily accessible and readily available. However, a number of rural Nebraska communities (and a few urban, too) are classified as food deserts, areas in which residents do not have ready access to fresh and healthy food. (No small irony that this land was once considered the Great American Desert.) The causes and creation of food deserts are complex, but one issue remains close to home: the rural grocery store. The Center for Rural Affairs, a local non-profit dedicated to advancing the future in rural communities, published a report in 2010 outlining threats to rural grocers and the importance these hold not only in providing access to fresh food but also in economic development and enhancing a sense of community. Many of the concerns outlined in 2010 have come to pass as local grocers continue to disappear. 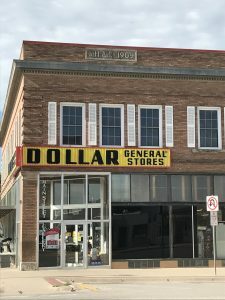 Recent reporting has shown that Dollar General is consuming increasingly large shares of rural shopping which threatens local independent grocers, including those here in rural Nebraska. Given the aforementioned championing of the Farm-to-Fork movement in one of the nation’s top agricultural production states, one would be forgiven for asking: what’s that movement about again? While ostensibly an effort to connect farmer to community, to improve health and the local economy, the Farm-to-Fork movement has become an appeal to those with the means to afford it. A movement embraced by area restaurateurs who promise to enhance the epicurean experience through courses created for a specific, and well paid, niche market. In so doing, the Farm-to-Fork movement embraces and advances an ideological truth: that farmers are vital to the health and wellbeing of our nation. In practice, however, the movement caters to a select few forks that can afford foods fresh from Nebraska’s farms.